The Niagara Falls Marriott Fallsview Hotel is located just 100 yards from the falls and offers luxury accommodations and a breathtaking view which will form memories to last a lifetime. The hotel was built in the shape of a concave curve to enable the guests to get the full view and sound of the falls without having to leave their room. 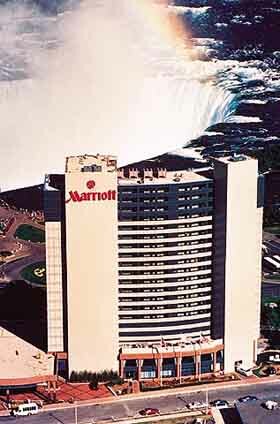 The Niagara Falls Marriott Fallsview Hotel is located in the midst of the attractions adjacent to the falls themselves. This is by far the most luxurious hotel in the area and is rated with 3 crowns. Niagara Falls remains to be considered the Honeymoon Capital of the World and is home to one of the 7 Wonders of the World - if not the most impressive. Area attractions include the unforgettable Journey Behind the Falls, the Maid of the Mist boat cruise, Niagara parks, greenhouses and gardens, the Niagara Falls IMAX Theatre and the Minolta Tower Center and Skylon Tower to name a few. There are 427 luxury appointed guest rooms with panoramic views of the falls. Amenities include air conditioning, in-room coffee maker, express check in, no smoking rooms, iron and ironing board, modem lines, phone service, safe deposit box, hairdryers, and mini bar in-room. Available amenities and services include valet/laundry, concierge, complimentary week-day newspaper, express check-out, brailed elevators, valet and private parking, babysitting services, AM/FM clock radio and cable TV. There are in-room movies, satellite TV, voicemail and data ports at a work desk with a lamp. There is a vent in each room that when opened, allows the roar of the falls to be heard in the room. Some guest accommodations include a fireplace and/or Jacuzzi whirlpool spas. Two-room family suites are also available. A full service Business Center is available for the guests which offers fax, copying and secretarial services. Nearby championship golf courses await the visiting player and there is the region's finest scenic wine route with over 38 wineries to discover. The guest may enjoy fine wines and Niagara cuisine in the Terrapin Grille which overlooks the falls. The on-site gift shop, news stand, restaurant and state-of-the-art fitness center are available for the guests as this is a full service hotel. 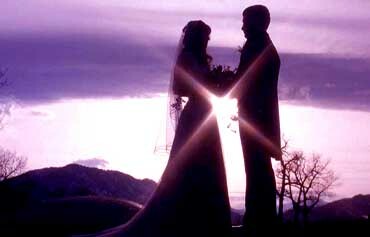 The on-site banquet and meeting facilities are equipped, including audio/visual. The professional staff of the Niagara Falls Marriott Fallsview Hotel insures that your visit will be a memorable and successful one.